Cambridge-based artist and contemporary furniture designer Ashley Baldwin-Smith from Ashwin Studio specializes in creating furniture from found objects, recycled engine parts and scrap metal. 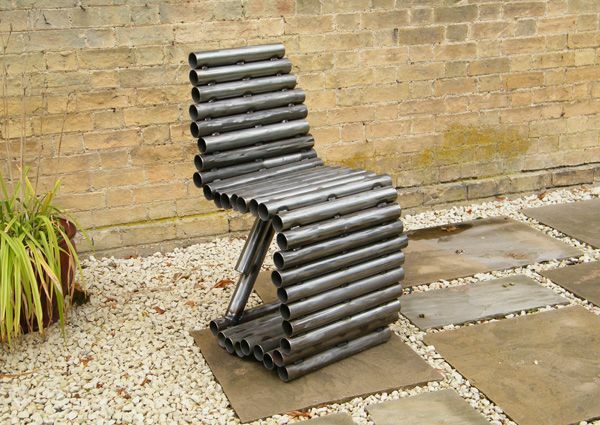 Baldwin-Smith recently completed the Tube Chair and the B Chair, a pair of sculptural chairs that are made entirely from steel tubes that are welded together. The chair is intended to function both as a sculpture and as a comfortable chair that can be used both inside and outside. Because of its success, Baldwin-Smith plans to make several more variations on this theme. Visit the Ashwin Art Studio website to see more of Baldwin-Smith’s work. Cambridge-based artist and contemporary furniture designer Ashley Baldwin-Smith from Ashwin Studio specializes in creating furniture from found objects, recycled engine parts and scrap metal. Baldwin-Smith recently completed the Tube Chair and the B Chair, a pair of sculptural chairs that are made entirely from steel tubes that are welded together. The chair is intended to function both as a sculpture and as a comfortable chair that can be used both inside and outside. Because of its success, Baldwin-Smith plans to make several more variations on this theme. Visit the Ashwin Art Studio website to see more of Baldwin-Smith's work.